I’m grateful to have seen this at the MoMA earlier this week. De Chirico’s work gets at something in me. I first saw his work at the MoMA back in May, but only three of his paintings were on display, and “The Nostalgia of the Infinite” was not one of them. I could see it, though, on the screen of the audio guide. It was in the MoMA collection, just not on display at the time. Ugh! 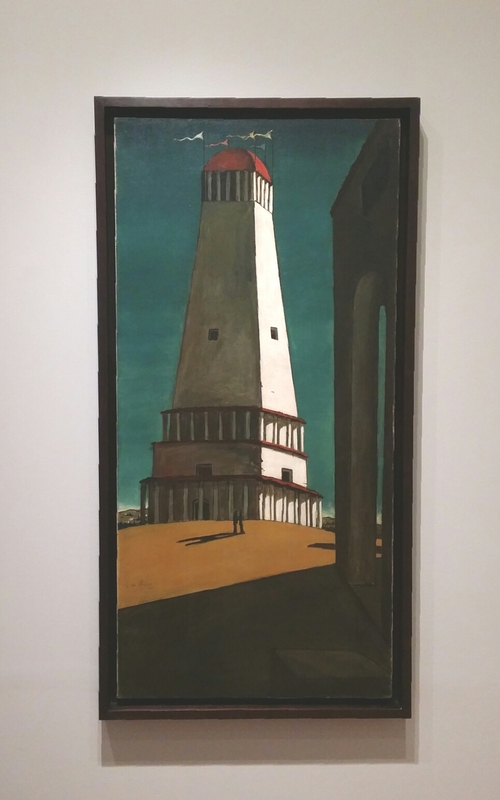 But during this visit, graciously provided by a friend of a friend, I found several of de Chirico’s paintings in a small gallery room, and the tower I had wanted to see back in May was present. Since May, I had read a bit about de Chirico and was surprised to learn this particular style of de Chirico’s — called metaphysical art — was short-lived, about three years. He founded the movement, Scuola Metafisica, in 1917 with Carlo Carra. They later had a falling-out. This entry was posted in art and tagged de Chirico, Giorgio de Chirico, MOMA, NYC, paintings, Scuola Metafisica, travel. Bookmark the permalink.